Why is Chobani Called Chobani? Shepherd. No matter the definition, it’s a word that has always resonated with Hamdi Ulukaya, the founder and CEO of Chobani. He has truly fulfilled an unmet need by shepherding a new wave of Greek yogurt and energizing the food startup scene in the United States. So much so, that 2017 Fast Company named Chobani as one of the 10 most innovative companies in the world, and ranked it number one in both the “Food” and “Social Good” categories. Ulukaya immigrated to the United States from Turkey in the fall of 1994. He arrived in New York City, with only $3,000 to attend Long Island’s Adelphi University. A few years later, he transferred to the University of Albany, State University of New York. Prior to moving to the US to for an education and to learn English and business, he came from a family of farmers who made cheese and yogurt. Fast forward 11 years, when Kraft Foods announced they would be shutting down one of their yogurt plants in Upstate New York. Ulukaya received a direct mail ad that said, “Fully equipped yogurt factory for sale.” He quickly recognized this as a major opportunity to scale his business. He quickly applied and received a loan from the U.S. Government’s Small Business Administration to purchase the yogurt plant. He hired several Kraft employees that were laid off, which ultimately prevented an economic downturn in the small community, and in 2007, Chobani Greek Yogurt hit the shelves and rapidly became regular item on our shopping lists. In fact, in just five years, Chobani became a $750 million dollar business. In 2016, he surprised over 2,000 full-time employees by distributing shares worth up to 10% of the company’s value when it either goes public or sold. It’s estimated that the future value of this distribution will exceed one million dollars. “This isn’t a gift,” Ulukaya said in a letter to employees obtained by USA TODAY. “It’s a mutual promise to work together with a shared purpose and responsibility. To continue to create something special and of lasting value.” But he didn’t stop there. In 2017, they implemented a new paid parental leave policy, offering 100% paid parental leave for six weeks for all full-time hourly and salaried employees. It’s beyond obvious that Ulukaya recognizes how an engaged and appreciated workforce leads to a happier employees, which leads to higher quality products, a more united culture and a healthier business. Why is it Called Chobani? Since Chobani’s launch, they’ve asserted their stake in the yogurt market, and according to Nielsen, own 36% of all Greek yogurt sales. Incredible, considering when they entered the market, Greek yogurt accounted for only .2% of the yogurt market in the United States. Now Greek styled yogurt makes up 50% of the U.S. yogurt market, something that can be attributed to Ulukaya. 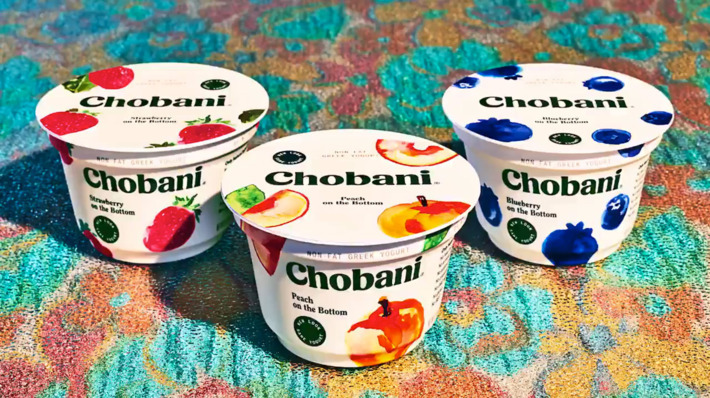 Chobani currently makes nine different styles of Greek yogurt: fruit on the bottom, blended, drink, a hint of flavor and plain. And, they also operate three cafes; two of which are in New York City and one in Tomball, Texas.